First in a tantalizing new trilogy about reigniting a forbidden desire from long ago…As heiress to a media empire Alessandra Sinclair was raised to put family obligations first. But everything changes the night her first love walks back into her life and turns her whole world upside down. 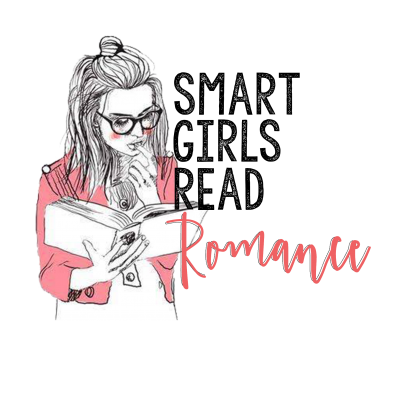 Haunted by the memories of a secret romance with a boy from the wrong side of the tracks, she can’t seem to get Hudson Chase out of her mind. 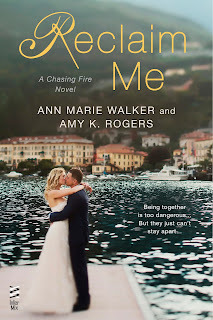 Once again torn between two worlds, Allie must decide how much she’s willing to risk to have the love she’s always longed for.Ten years is a long time to wait, but billionaire Hudson Chase didn’t become CEO of one of the country’s fastest growing companies by giving up on what he wants. Now that he’s got Allie in his sights again, he’s determined to make her regret breaking his heart. And this time, he’s going to make damn sure he’s not so easy to forget. 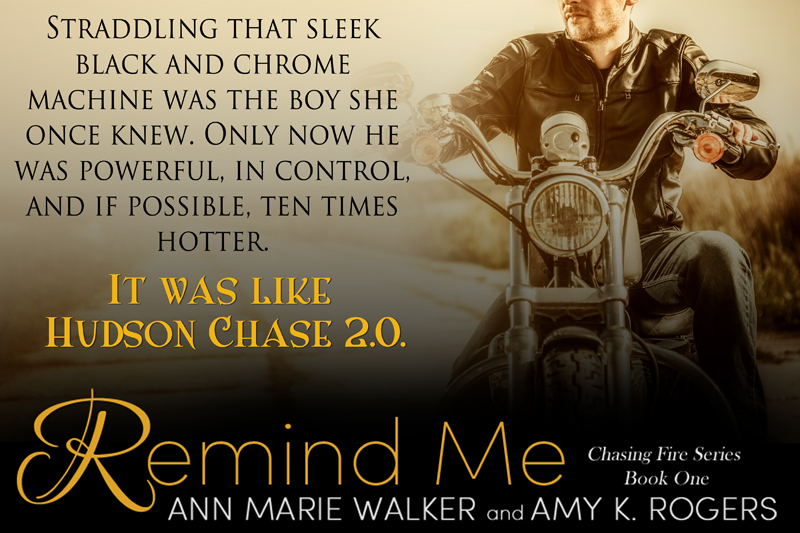 Includes a preview of Release Me book two of the Chasing Fire trilogy. Get ready! This book is one wild ride! 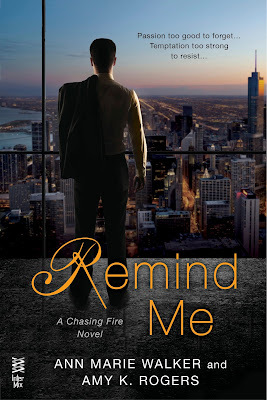 I would definitely recommend Remind Me for anyone who loves Fifty Shades or the Crossfire Series. But, I will admit this book left me thinking, “Gideon who?” And, I’m now an official #HudsonChaser! Young love ended too soon is rekindled and explodes in the most amazing way! A boy from the wrong side of the tracks, turned billionaire (Yeah, I know, just go with it! Suspend reality, the story is GOOD!) finds the one that got away. She’s the heiress to a media fortune who turned her back on the bad boy after a heated summer romance. Ten years later, the connection between Hudson and Allie is an explosion of pent-up emotions and unfulfilled fantasies. The story is electric and the chemistry between Allie and Hudson is off the charts. This is one of the steamiest reads I’ve encountered in quite awhile. I could see similarities between Hudson Chase, Christian Grey and Gideon Cross. At the same time, the story felt new and different. AND, I liked Hudson better than Gideon – there’s baggage in Hudson’s life, but not nearly as much as Gideon and Eva! The relationship between Hudson and Allie is based on a shared history and while there are lots of sparks, it’s no insta-love. AND, Remind Me also has several really smarmy villains – ya gotta love that! I am normally not a fan of cheating and I will warn you, this book contains a LOT of cheating. But, I found it didn’t really bother me. I believed it to be integral to the storyline and while not excusable, it made sense in the context of the characters and the story. Get yourself a glass of wine. (Or a whole bottle, we don’t judge.) Find a quiet corner and consider a cold shower. This is one steamy page turner you don’t want to miss! Release Me, Book #2 in the series releases July 21 and you’ll want to be ready. I already am! An ARC of this book was received via NetGalley in exchange for an honest review. 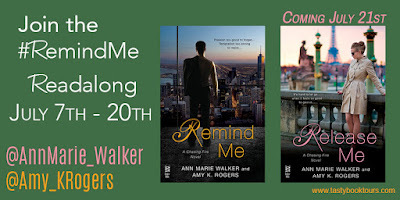 Thank you so much for hosting REMIND ME! !